The cover of a book I received last week carries a neat photograph of a young man I first met towards the late -1960s when I was writing a column on the arts for the Sunday Observer. After nearly four decades he hasn’t changed much. He has the same smart look – the same smile that I noticed when he dropped in to see me at Lake House with a fellow school-mate of his. They were Anandians. As students they were doing a film and wanted to know whether I could write about it. And I did, because I felt the youngsters deserved some backing. The photograph is that of Bandula Padmakumara, the creator of ‘Mul Pituwa’ – the early morning TV show to which many have got addicted. 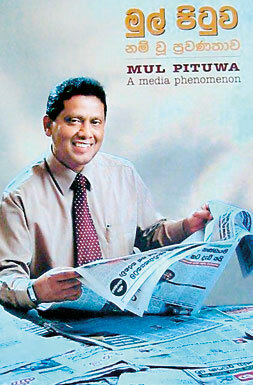 The book titled ‘Mul Pituwa – A media phenomenon’ marks the completion of ten years of the highly popular programme which started on July 2003 over Swarnavahini. The book records the impressions of a host of seasoned journalists including several editors of national newspapers, academics, columnists, and at least one politician. They all applaud Bandula for introducing such a novel programme to present the day’s headlines in all national dailies published in Sinhala, Tamil and English. While stressing that he has fought with Bandula on trade union matters, Dr. Wickremabahu Karunaratne confesses that he watches ‘Mul Pituwa’ every day. He describes Bandula’s effort as an art and a rhythm. “I am amazed at the way he does it,” he says. He compares Bandula to a shrewd investigator referring to his ability to present a piece of news hidden in a corner of an inside page giving it an exciting interpretation. In the book are certain articles which touch on the progress of the print and electronic media over the years. Professor Tissa Kariyawasam, for example, presents an overview of the electronic media in the world and a brief history of television in Sri Lanka. Introducing Bandula as the pioneer of a unique TV feature, he says he is reminded of David Frost’s ‘Good Morning Britain’. As readers, when we take a newspaper into our hand, we glance through the news headlines on the front page. Bandula was clever to pick up this practice as the title of the programme. Of course, he does not stick to only the front page news. He sums up interesting news, features and cartoons in all the dailies. A tough task indeed – but he mastered the art right from the word ‘go’. It beats me as to how he gets to the TV station by 3.15 a.m., goes through the newspapers, picks on the material to be presented and appears spick and span to face the camera at the appointed hour. On top of it, to build up confidence to face a TV camera and catch the attention of viewers for half an hour at a stretch is no easy task. Veteran media professional Edwin Ariyadasa says the daily uninterrupted presentation of ‘Mul Pituwa’ by the same individual, for nearly a decade, has unquestionably to be characterised as “phenomenal”. In what he calls “a physical ordeal”, he sums up the presenter’s daily routine. “On a daily basis this presenter has to wake up dutifully in the wee hours of the morning. From then on, each minute has to be spent poring assiduously over the print media publications of the day. And, those media products that have to be carefully studied are trilingual. He has to turn to on-line sources to update the world of the day’s news. The analysis of the programme by a ‘Special Correspondent’ discusses the secret of the success of the programme and its impact.�The articles provide easy reading and present the writers’ thoughts from different angles.�As for Bandula’s looks, a pictorial feature provides the answer. The photographs show how he is made ready every morning. Take a look.